I want to create a batch file(*.bat) that can auto install some of my programs from my CD silently. Actually i own a cyber-cafe and i format my computers once a week. 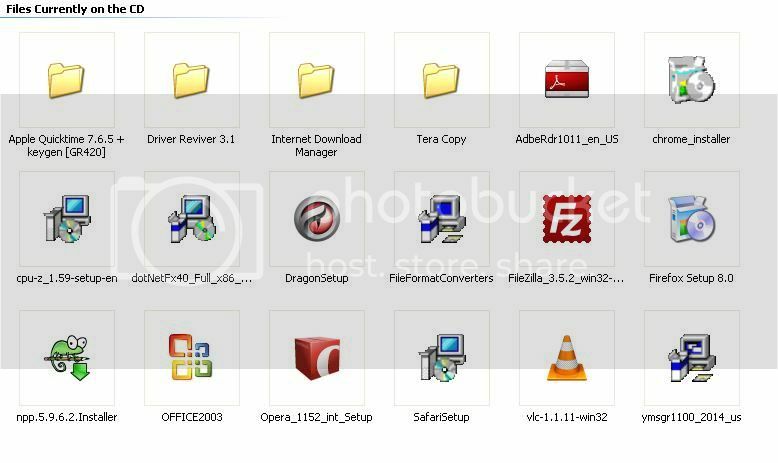 After formatting and re-installing XP, i install some programs like Adobe reader 10.1.1, Google Chrome, Microsoft Office 2003, File formats converter, google chrome, mozilla firefox which you know is a necessity for a cyber cafe user. Installing a program one by one takes a lot of time and somehow frustrating. So i want it to be automated. I am posting a screen-shot so that it would be easy for you to figure out the issue. Note:- 1. The CD drive letters are not same for each and every machine. 2. I want silent install please. Should i use /s or something like this? If anyone would like to help kindly post the required solution. If for ease of writing command, i can rename the files accordingly. I agree with you but there is a way by which we can bypass the user interaction. In-fact we can use the silent install switches for exe and msi. I know silent switch for Adobe reader AdobeRdr1000.exe /msi EULA_ACCEPT=YES /qn. We can get a silent install for Mozilla Firefox from http://www.frontmotion.com/. They provide msi package for firefox. I can use the /s switch for silent install for msi packages. Come on. Why isn't some-one replying and not even a single thread in the least week in this section. Ok I managed the command for auto-initiating the setups and yes in the silent way but the problem is that this command opens all the setups at the same time and error occurs saying " One or more installers are currently running ......."And yes its true all of them run at the same time. So i need some command that will run/open one setup at a time and after it is done, the next is taken into action. Sorry to say but there is no help provided by the forum. I had to figure out all the issue myself. And yes the thing has worked. The correct code is written above. I hope it would help someone. Thanks for the batch code, indeed it might help somebody someday. These batch codes really helped me a lot. Thanks for these super wonderful codes. Hey, thanks for doing the leg work. The code helped me figure my thing out, too. Have you ever thought of creating a disc-image of a clean install, and then merely loading that every time you want to format your computers? Loading a disc image is completely "silent" and you can save any degree/amount of software and/or configurations. I use Acronis True Image, but any disc imaging software will work. Create an image and store it on a safe medium (e.g. dvd or a network drive unavailable to your customers). I run mine from a bootable dvd, but I suspect you could do it from a bootable USB Key, too. Takes 1-2 minutes per machine; start it and walk away. Oh, and just an FYI - Repeatedly asking why no one is answering is the surest way to make sure your question is ignored. I'm only dropping a courtecy note because I'm using the fruits of your labour. What about a batch file to unistall the same apps or just multi apps? how to write the bat file for multi software auto installation?